While on vacation, I like to keep it simple and summery during the day. Next week I’ll be leaving on my honeymoon, flying from my current cold and rainy climate to one that is much more hot and sunny. As I’ve been thinking about what makeup I’ll be bringing along, I’ve come to the conclusion that vacation brings out my beauty split personalities – so simple for day, much more dramatic for evening. Below, a look at what I’ll be packing for a beautiful honeymoon. Of course my number one priority is sunscreen, and since my husband and I are both paler than pale and burn easily, I’m packing SPF 70. However, that does not mean that I wish to look pasty white throughout my trip. Enter my newest obsession, St. Tropez One Night Only Instant Glow Body Lotion. This smooth lotion looks scary dark and bronzy in the tube, but is easily rubbed into skin to create a warm, surprisingly natural glow. Once dry it does not rub off on clothing (or sheets), and it smells warm and summery. It makes skin feel ultra-smooth, and washes off easily with soap and water. 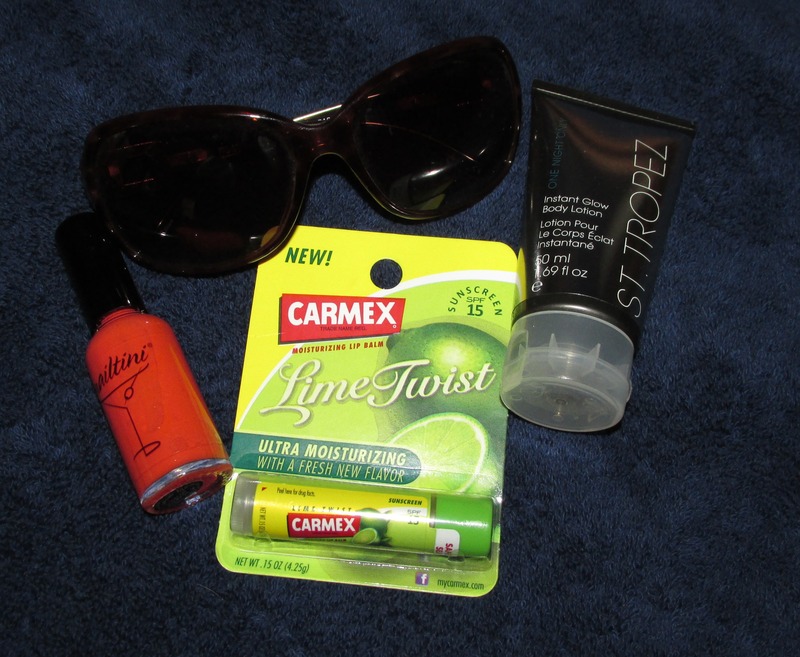 I’ll also be wanting smooth, unburned lips during my trip, so I’ll be sure to pack a tube of Carmex Moisturizing Lip Balm in Lime Twist, an SPF 15 balm that is ridiculously silky, long-lasting, and has a refreshing, tingly feeling. And since I’ll be busting out my sandals for the first time since last summer, I’ll need a punchy pedicure. Right now I’m loving Nailtini Lacquer in Mai Tai, a fun red-orange that looks great on pale skin or with a tan. I’ll stay pretty bare-faced while out in the sun, sticking to my favorite BB cream and my Carmex during the day, but at night, I’ll kick things up a notch. BareMinerals Mineral Veil will even my complexion and keep any unwanted shine at bay. 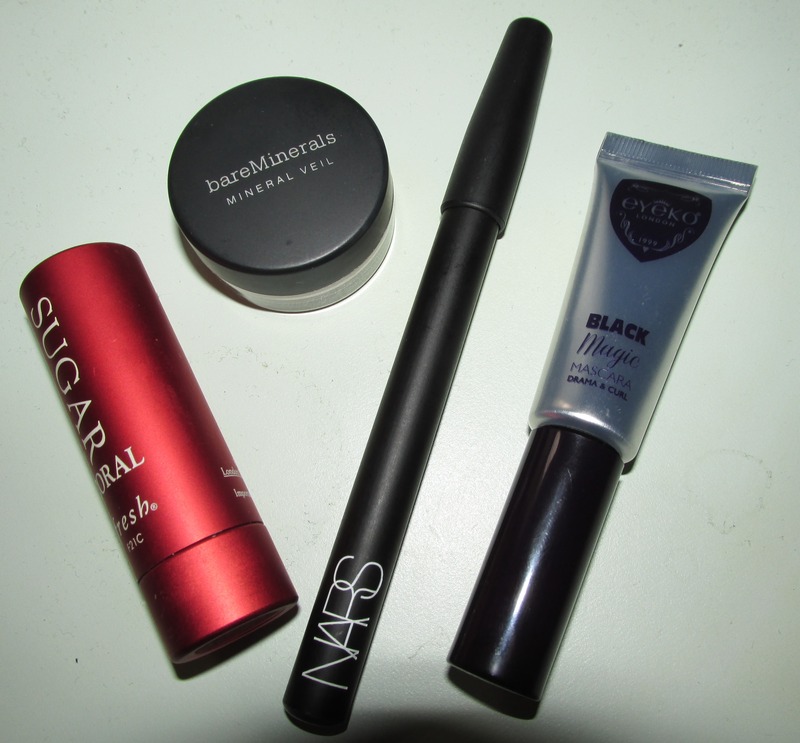 I’ll swipe on my favorite summertime lip color, Fresh Sugar Tinted Lip Treatment in Coral, and a festive evening eyeliner, NARS Glitter Pencil in Le Sept, a sparkly dark purple. Naturally, I’ll finish it all off with curled lashes and my favorite vampy mascara, Eyeko Black Magic Mascara. 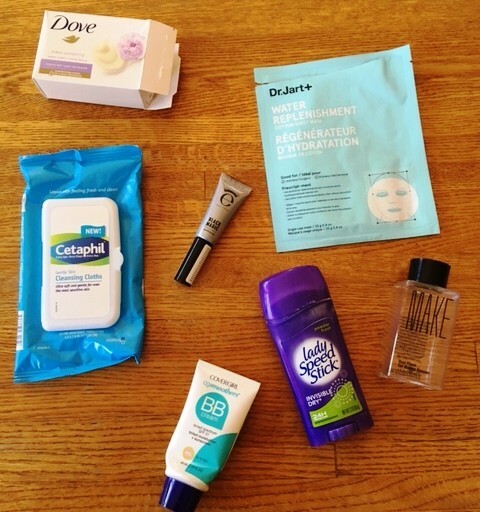 What are your vacation beauty favorites? Don’t forget to do a little pre-party grooming! 1. Go the extra mile. Before you start getting dressed and ready for your party, take the time to do a little extra grooming. Do your eyebrows need to be touched up? Break out the Tweezerman. Trim any jagged nails or cuticles. You don’t want an errant hair or cracked cuticle to undermine all the work you put into looking your holiday best, do you? Finally, build time into your pre-party schedule to do a face mask. 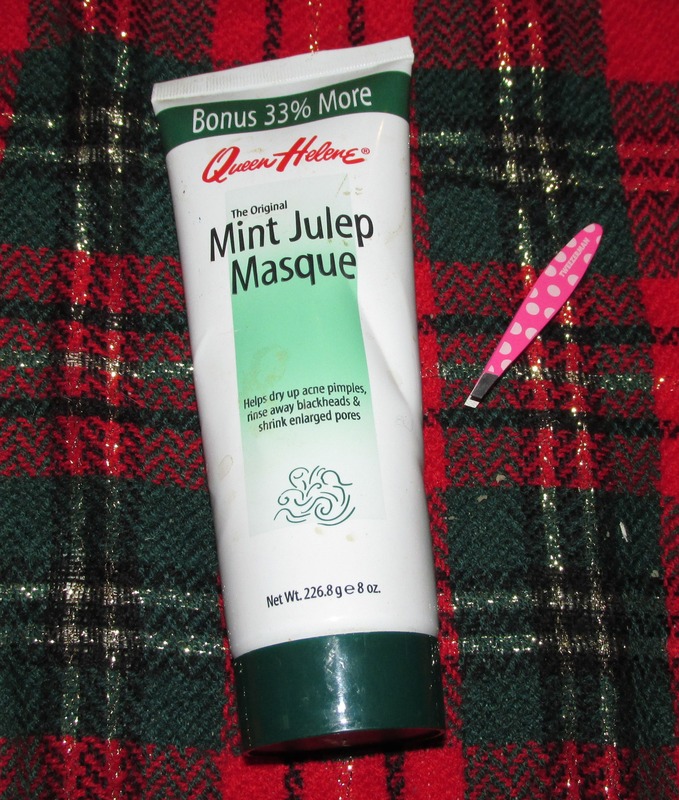 Unsurprisingly, I recommend Queen Helene Mint Julep Masque for this. It really helps build a smooth and glowy foundation for your makeup. 2. Double up. Speaking of foundation, my new favorite method for faking a flawless complexion is as follows. First, I smooth a moisturizing BB cream all over clean skin. 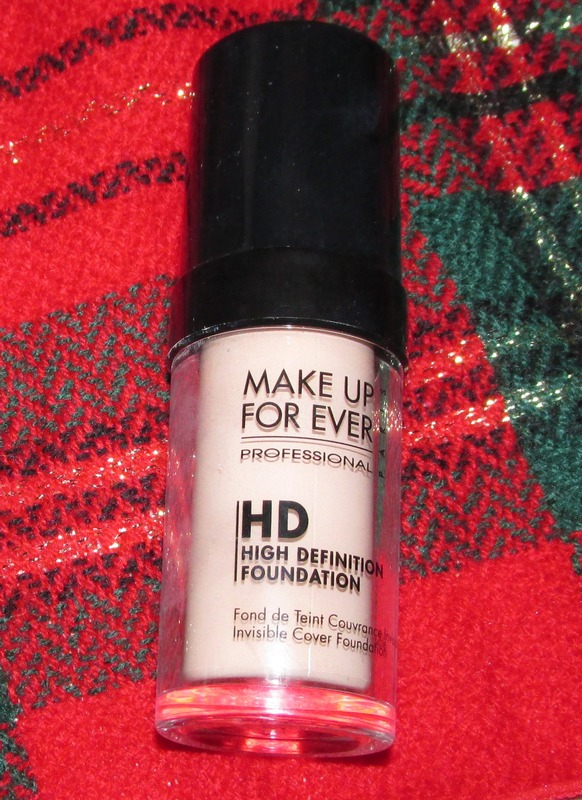 I then follow up with a thin layer of the world’s greatest foundation, also known as Make Up For Ever HD High Definition Foundation. The result is soft, smooth, impossibly perfect skin. 3. Triple threat. 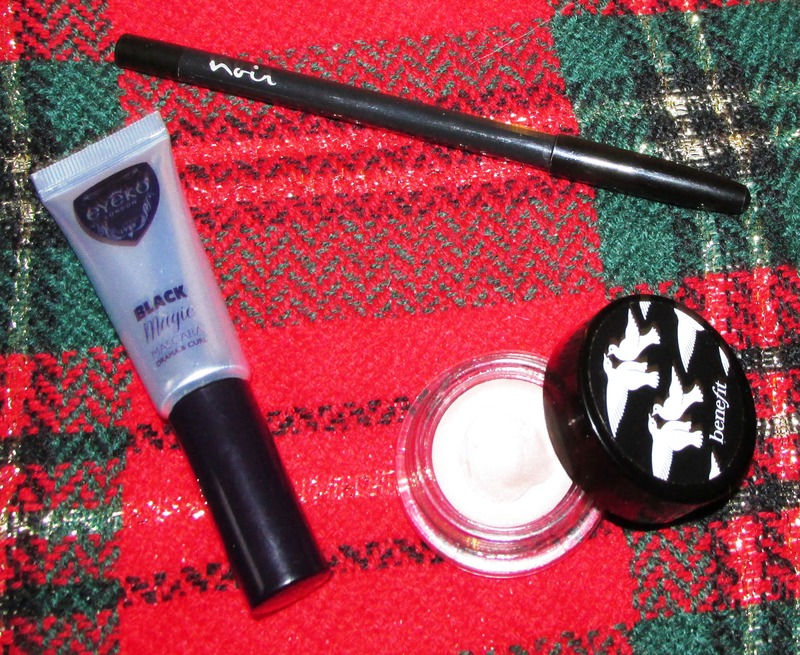 When it comes to putting on pretty eyes, I haven’t found a better trio than Benefit Creaseless Cream Shadow/Liner in r.s.v.p., a stay-put shimmery champagne; Noir Long-Wear Eyeliner in Forever Noir, my all-time favorite black liner; and Eyeko Black Magic Mascara. Eyeko knows how to get eyes right, and this mascara is no exception. It darkens, lengthens and curls without clumping, has an easy-to-use curved applicator and doesn’t smudge, even when I absentmindedly rub my eye. Black Magic is perfect party mascara – get it now! 4. Get lippy. I’m really feeling a bold lip this year, and there are some excellent party options available. If you want to keep it classic and go for a red lip, you can go really red with Stila Stay All Day Liquid Lipstick in Beso. Why not go bold with Obsessive Compulsive Cosmetics Lip Tar in Anime (top) or Stila Stay All Day Liquid Lipstick in Beso? Want to do something a little edgier? I’m obsessed with Obsessive Compulsive Cosmetics Lip Tar in Anime, a gorgeous neon pink. I find it surprisingly wearable. Both of these lip colors stay put once they set, so use caution when applying and start with less than you think you need. I also recommend a lip primer before application; try Chapstick Hydration Lock, which moisturizes and helps keep lip color in place. Looking for something a little more subtle? Fresh Sugar Rose Tinted Lip Treatment is a lovely red tinted balm, and Maybelline Baby Lips in Pink Punch is a wonderful, less-intense bright pink alternative. What’s your go-to holiday look?